Anyway, just after I stalled it once again and lost all hope of ever getting out of pitlane, I finally did manage to pick up what felt like a lot of revs and get the Mahindra bike going. And by the time I did finally exit pit lane, I was in deep, deep trouble. You see, I've never ridden anything quite like this. But first, an introduction to the motorcycle itself. 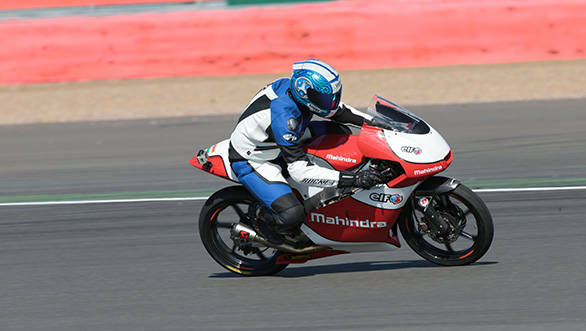 The Mahindra MGP3O you see here is the motorcycle that Mahindra uses to race in the Moto3 class as well as for the team they have in the Italian championship. 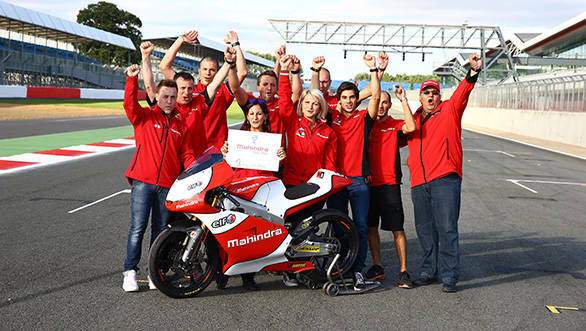 And shortly, a French team called Ambrogio Racing will also switch to Mahindra power, making it five motorcycles in all in Moto3. The class specification means that the motorcycle weighs about 80kg without fluids and the engine makes about 50PS. That power figure isn't earth shattering, but when attached to a chassis that weighs less than me (82kg with all fluids), the result is a motorcycle that hits 240kmph at the fastest tracks in the calendar. And let me be candid, this paragraph was the only way I was going to get me, the MGP3O and 240kmph in the same sentence. So I had to do it. Silverstone isn't a very complicated looking track and in any case we were only riding the relatively simple bottom loop based off the F1 pits. But now, on the racebike, I'm having trouble focusing. All my skills seems to have been left in pitlane. Part of this is my unfamiliarity with Silverstone. And part of it is the equipment I have here, the MGP3O has a quick shifter which means I don't have to roll off the throttle for up shifts. The quick shifter cuts the spark momentarily when I tap the gear lever. But I rolled off for shifts anyway, out of sheer habit. It also has a slipper clutch, which I never used, blipping my way down the gearbox into corners. Then there is the race-pattern gearbox - first is up and the rest of the gears are down. Efren Vazquez said to me, "As you go down pitlane, shift up and down lots to get used to the pattern and before every corner say, first is up, to help you remember." This helps. But only a little bit. The street gearbox pattern is very deeply muscle-memoried in. There are also the slick tyres. "You've never used slicks before? Ok, is no problem. Just be careful." But of course! Finally there is the size. The team says they don't build bikes to riders because they have four riders and now the opportunity to offer motorcycles to other teams as well. So it is better for Mahindra Racing to build a competitive bike that many riders can use. But it is, no matter how you look at it, tiny. The tank is as wide as my glove and as long as my glove. I am not even slightly joking. When you hug the tank, your knees feel like they're touching each other and the motorcycle is compact and taut and very, very small. As in 83kg of me is squeezed in to fit. The first lap passes in a strange blur as I come to grips with the bike and it was only on the third lap that I finally found the confidence to stop worrying about stalling and crashing and start paying attention to the sensations of the MGP3O. And the first thing I noticed was that it doesn't vibrate. 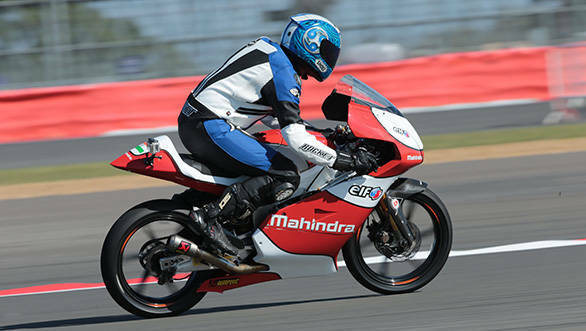 Normally, a racebike isn't expected to be refined, just powerful and the Mahindra is extremely smooth whether it be through the pegs, bars or tank even at its 14,000rpm redline with all the LED lights on the dash lit right up. The gear changes are also quite slick, something you expect again on a production bike. A racebike needs to be precise, but slick is a bonus. The engine, as expected, doesn't really like low revs, but once it hits its stride, it is extremely quick to rev and almost all the journalists who rode the bike found themselves pinging off the limiter until we settled in. The nature of the power also tells you how to ride it - if you have the skill and confidence, that is. 50PS is not a lot and building speed if you've shed it, takes time. Which is why fast riders like Oliveira and Vazquez use and maintain as much corner speed as possible. Which brings me to the star of the show for me - the chassis. Visually, it is a wonderful looking chassis. The aluminium spar frame hosts the 250cc four-stroke engine and in the headstock are ducts to allow the ram air intake in the nose to pressurise the air box at speed. The engine itself is astonishingly small. At either end are Ohlins forks with telemetry equipment visible and Dunlop tyres on superlight OZ rims. Brembo supplies the spec brakes and the rest - all the bodywork, fairing stays etc, including the subframe is carbon fibre. What that means is that if you breath out through your left nostril alone, chances are the motorcycle will start to turn. The turn-in is a revelation and the use of force is almost optional. Well, at least at the speeds I was circulating at anyway. What is equally impressive is that sense of grip and stability mid corner once you've got the throttle back on. And all these quick reactions are bolstered by unwavering, surgical precision. The motorcycle goes wherever you point it and that presumes you know what you're doing. Which is why Oliveira and Vazquez ride for Mahindra Racing, and I'm just a lucky guy with a great job and for the moment, a tiny motorcycle. The light weight and diminutive size also give the brakes outsize power. The first time I hit the brakes at the end of the main straight (Oliveira said you do not really need to...) I thought I was going to come off the bike and land in a comedy heap in front of it. And that the MGP3O would be standing at the turn in point laughing its aluminium guts off. But you do get more used to it and these brakes are amazingly powerful. Which means they shed speed with incredible ferocity. By the time I got the hang of it, well, by the time I wobbled about less noticeably, the pit board said IN, which was the agreed upon sign that it was time to come back into the pits. So obviously, I blew by the pit entrance and had to go down the main straight with my hand up in apology as I droned past the Mahindra Racing team feeling like an utter and complete idiot. When I successfully returned to the pits - they sent birthday boy Efren on a Duro to the pit lane entrance so I could be flagged in - the team behaved very maturely. They never let me sense how relieved they were that I was off their precious motorcycle and I mumbled a set of barely appropriate apologies and wandered off to get some alone time and to ponder the experience. A racebike is perhaps the purest form of the motorcycle, with all the usual compromises for comfort and utility stripped away. And in the 250cc class, this is a credible competitor in the absolute top flight racing class in existence. That kind of focus means that the motorcycle requires a lot of skill and is a very rewarding ride when you get it right. 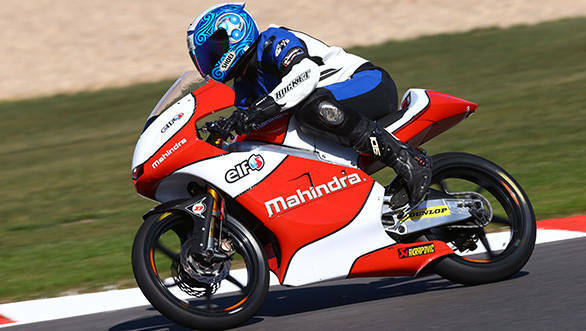 The Mahindra MGP3O is an extremely impressive racer and full credit must go to both Mahindra Racing and their Swiss partners Suter Racing for developing such an effective racebike in a very short time. I only got the full sense of it once, on my last lap at the end of the Hangar straight. I braked as late as I dared. Tipped the bike in with a whiff of effort. Got back on the gas smoothly. And then rolled the throttle quickly to the stop, feeding the bike gear after gear as the redline flashed on the speedo. It felt so pure, so precise and so great that I thought to myself, "Yay! I'm finally riding a proper racebike like it should be"
And then in the middle of the chicane I realised that I'd blown by the pit entry when I was actually due in. Drat.